Exquisite Hand Carved Nativity Set From Bethlehem. 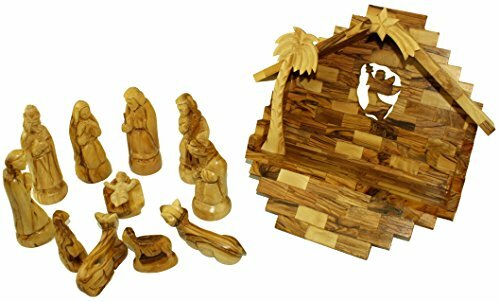 This Olive Wood Nativity Set makes a very meaningful and special gift that will be cherished for a lifetime. Set includes: Joseph, Mary, Baby Jesus (in his crib), Three Kings, a Shepherd (with staff), a Cow, a Donkey and Two Sheep. The height of the figures is about 4.5 to 7 inches. Set includes an Olive Wood collapsible stable for easy storage. Complete set comes with our Certificate of Authenticity with the Lord prayer card and the Nativity story. Exquisite Hand Carved Nativity Set From Bethlehem. Set includes an Olive Wood collapsible stable for easy storage.